I've always been fascinated by daily prayer rituals, whether one follows the focus of a particular religious order or not. Do you pray the rosary as you fold laundry? Listen to the daily Mass readings on a podcast as you clean the house? Pray in the car? If you do, I want to know about it. :) Prayer is a very personal thing, obviously, and we all bring our own touch to it. Prayer is also something that is easy to neglect, but it's very much a relationship with God. When you neglect that relationship, it will wither and die. When you tend to it, it will start to flourish slowly but surely. (2) Liturgy of the Hours - Even the third order in the Dominicans are called to pray the Liturgy of the Hours, just like the priests and religious sisters. I own the complete 4-volume set of the Liturgy of the Hours, but I'm going to be honest and admit that for the time being I admire their lovely faux leather form on my bookshelf but rarely use them. Sometimes during a major liturgical season like Advent or Lent I'll use them, but I have come to accept that between family and work I cannot consistently (and with the proper focus) carve out enough time to pray fully even just Lauds and Vespers. So, I have come up with a substitution, and I'm certain that God is ok with this. :) I use my Magnificat magazine, which includes a morning and evening prayer consisting of psalms, a reading, a hymn, intercessory prayer, and a meditation. This is private prayer, rather than the official prayer of the Church like the Liturgy of the Hours, but the setup is lovely and works to the same end. Overall it is much shorter than the Liturgy of the Hours, and so I pray it every day and that is what matters. I really do recommend some sort of structured morning and evening prayer. The morning prayers are oriented to starting your day and lifting your eyes up to God, while evening prayer helps you wind down and reflect on the day's events. For any vocation, this is an important thing. (3) Devotion to Mary- Dominicans are very devoted to Mary, as St. Dominic himself was. This has always been a no-brainer for me. I have always felt close to Mary and I credit her with my adult reversion back to my faith. Now, as a mother, I relate to her all the more. At the beginning of the year I did a 33 day preparation and subsequent consecration to Jesus through Mary and I can't tell you how much impact I have felt from that devotion. I plan to renew that consecration yearly, and with the book I used, 33 Days to Morning Glory: A Do-it-Yourself Retreat in Preparation for Marian Consecration by Fr. Michael Gaitley, it took not more than 10 minutes per day to read the entries and prayers. I highly recommend it. (4) Mass - As third order Dominicans we are supposed to try to attend daily Mass. I do so love the use of the word "try," don't you? :) I *adore* daily Mass, but so often I am not able to make it. Most weeks I can go 1-2 times in addition to Sundays. Some weeks I cannot go at all during the week, but I'm trying to make that the exception rather than the rule. Even one additional Mass between Monday and Friday is a tremendous boost to the spiritual life and can be accomplished with work and kids. (5) Spiritual reading - Dominicans are scholarly types (read: nerds. I fit right in) and we are encouraged to practice lectio divina or other spiritual reading to edify our relationship with God. Reading has always been easy for me because I love to do it. Now I will grant, with small kids getting reading time isn't what it used to be. I used to devour books. Now, it takes me weeks to read through anything more substantive than a Harlequin romance. I always read in bed prior to falling asleep, and in the morning over cereal and coffee. Aside from that, well...reading time, how I miss thee. But even those two opportunities are enough for me to get in some spiritual memoirs. I try to mix in some heavier reading at least twice a year, maybe a work by a Dominican saint, something like that. If you become a lay Carmelite your fodder is so wonderful that your cup will runneth over. And so, there you have it. A day in the prayer life of the Catholic Librarian. :) I recently discovered a related little apostolate that is right up my alley called MonkRock. "You don't have to be a monk to live like one!" is their tag line, and I discovered them first on Twitter (@MonkRock). They Tweet inspirational sayings and ideas, and maintain a blog on monastic topics. I mean, did you ever?! A BLOG ON MONASTIC TOPICS. Ok, my world can begin rotating again. I just love that so much. I have always been drawn to the religious life, although I ultimately found that wasn't my vocation. And despite being a layperson, I still feel called to do what I can to live *a* religious life in my vocation as a wife and mother. Mike always looks jokingly worried when I start talking about nuns because I get so passionate about the topic. Like I may seek out an annulment and head off to the convent. :) I'm still slogging away on The Ear of the Heart, and I'm finally at the part where Mother Hart enters the postulancy in the cloistered Benedictine community that she chose and I'm SO INTO IT. Review coming up hopefully next week in Catholic Book Club. What a blessed post for me to read today! Thanks so much for sharing this. 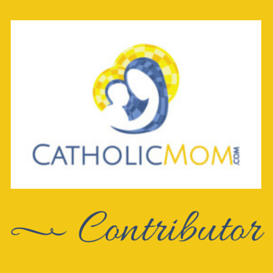 It is WONDERFUL to see another mother as into Catholicism as I trying to fit it all in! 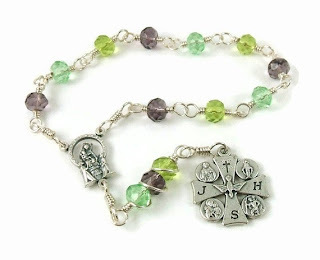 I have managed to get the rosary pretty much memorized so I am able to go "beadless" when praying in the shower or on a walk :), though I prefer praying with the beads. I have been feeling called to do the Total Consecration to Mary, so awesome to read that you did that and it has been impactful. I still need to read True Devotion to Mary and then I plan to pick a date. I also feel interested in religious life, but clearly it is not meant to be since I am a wife and a mom! God needs me here so I must find a way to balance the two.. an ongoing struggle. Have you watched A Nun's Story with Audrey Hepburn? Well worth the watch if not! I also sometimes pray the Angelus at noon, because it's quick and at lunchtime so easy to fit in. I love to read too and one thing that's helped some with kids around is buying free books for my Kindle app on my iPhone/iPad (there are lots of good free Catholic ebooks) and then reading it while standing in line, waiting at the doctor's office, riding as a passenger in the car, etc. We have just recently established a pretty good routine. My children are older, the youngest is 12. So for me I get up early and do the morning prayers from my 1962 missal. I sometimes manage to squeeze in a rosary before coffee is ready. As a family we pray a rosary every night led by my husband. This is new and wonderful! Then we say a set of prayers as our evening prayers (The Litany of the Blessed Virgin, the Act of Contrition, The Saint Michael Prayer, the Anima Christi, and then a prayer for the family that we got from our Columbia magazine). This is shorter than it sounds and each of the children say a part of the Litany. We go to daily mass (I make it on all but Thursday). My husband and I go to Adoration Chapel for an hour on Friday afternoons and the family goes after Mass on Saturday morning. We haven't been in this routine very long but it has helped much. We just recently purchased holy water fonts and have them at three of the doorways in our house. We tease each other about dousing them with holy water when they are being cranky. ;) This has been a tremendous help in keeping the bickering down and removed the sense of doom that seemed to be lingering over us. I know I have said this several times, but these are new practices and as such are fairly threatening to the evil one and I was feeling like we were being attacked. The holy water fonts have really helped with that. Whew! Sorry for such a long comment. Take care and keep up the wonderful example you are being for us all! These are some great ideas, thank you so much ladies!! NFP - Isn't that just "the Rhythm Method?!" Cry Rooms: Lifesaver or Cross to bear? A 4th of July Smorgasbord (sp?) post!